Philly was a surprise. I liked it right from the moment I set my foot. On arriving at 30th Street late in the evening, walking past the Amtrak building and the grand SEPTA station, Market Street and Rittenhouse Square to Waverly Street where my friend lives, I came across many row houses or in other words Terraced houses. Little did I know that first ever row houses in the USA were built in Philadelphia, Pennsylvania! Getting to Philly from North Jersey wasn’t a hassle. For it is well-connected by road and rail. I took a 2.5-hour bus ride from NYC. NYC because it has a better frequency of buses. One can also take SEPTA Train (Southeastern Pennsylvania Transportation Authority) from Trenton, the capital of NJ. It’s just a 1.5-hour journey if you choose to drive from North Jersey. On Day 1 we started our city tour from City Hall, which is the seat of government for the city of Philadelphia. City Hall is topped by a statue of William Penn, the city founder and is a majestic structure right in the middle of Center City. 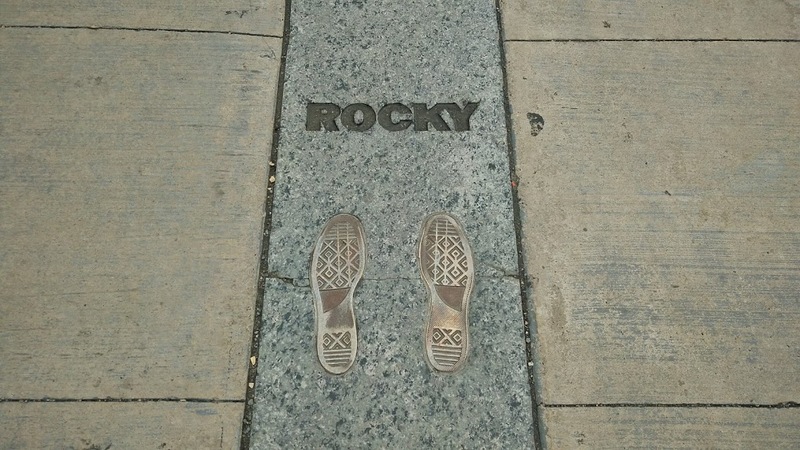 The most impressive thing about the streets of Philly for me is the historical markers administered by The Pennsylvania Historical and Museum Commission. These markers tell the history of the City and its landmarks. Walking past the City Hall into Logan Square, admiring the City’s skyline, we entered Benjamin Franklin Parkway. Flags of many countries are displayed on the Parkway, which represents countries with significant populations in Philadelphia. The Philadelphia Museum of Art sits majestically at the end of the Benjamin Franklin Parkway. 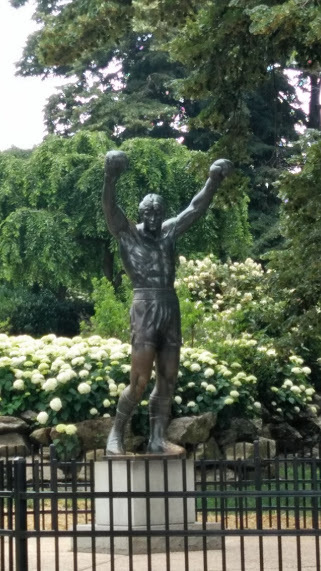 One of the City’s most famous pieces of public art is a sculpture of a fictional character – Rocky Balboa played by Sylvester Stallone in the movie Rocky. The statue is located beside the Museum of Arts. We saw a long queue of people waiting to get a photo with the statue posing like him! Few others running up the steps leading to the entrance of the Museum like Mr Stallone did in the movie and mimicking his triumphant celebration!! “The Thinker” outside of the Rodin Museum. Next up we made quick stops at the National Constitution Center, United States Mint which is the first mint facility built in the USA and the First Bank of the United States. Many of the Country’s firsts are in Philadelphia because it was one of the nation’s capitals during the American Revolutionary War. Philadelphia is also the final resting place of Benjamin Franklin, one of the founding fathers of the United States. Another reference to the Revolutionary War in Philadelphia is the making of the First American Flag by an upholsterer named Betsy Ross. The house where Betsy did her patriot sewing secretly is converted to a museum promoting her story. A few blocks away from Betsy Ross’ house is Elfreth’s Alley, a collection of early American row houses of several artisans, preserved and inhabited to-date. A short walk from the alley takes you to Race Street Pier on the Delaware River Waterfront and the magnificent blue bridge named after Benjamin Franklin which connects Philadelphia to Camden, NJ. One of the most visited places in Philadelphia is the Independence Hall and Liberty Bell. Liberty Bell is an iconic symbol of American Independence. The Bell first rang in Indepence Hall. It was used to call the lawmakers and the people of the town together to hear the reading of the news. There is no evidence that the Bell rang on the day of Independence. Exhibits at the Liberty Bell Center talk about the founding of the Bell and its use as an icon to abolish slavery. There’s also a memorial to mark the site of George Washington’s house, a.k.a the President’s House which was uncovered during the excavation for Liberty Bell Center. Ironically, George Washington had enslaved nine African Americans. This memorial is to acknowledge the slaves and their place in the US history. An attractive pop-up on the Delaware River Waterfront is Spruce Street Harbour at Penn’s Landing featuring floating barges, beer garden, restaurants, welcoming beach chairs, and colourful hammocks. Delaware River separates Pennsylvania from New Jersey. Penn’s Landing offers a beautiful view of both the state borders. Before calling it a day, we visited Franklin Square Park to experience a Chinese cultural event with live performances and a variety of lanterns display which was nothing less than a visual treat. Treated ourselves to another visual on our way back home at South Street Bridge, city lights reflecting in Schuylkill river. We started our Day 2 at The Eastern State Penitentiary (ESP). The imposing fort like structure from the outside is a prison built on a radical plan of linking solitary confinement with moral instruction. The Penitentiary was seen as a forced monastery, a place for reform, that would allow a criminal to meditate on his crimes with no corporeal punishment. This Pennsylvania system of penology became a model for prisons worldwide. Today it stands in ruins in the Fairmount neighbourhood of Philadelphia. ESP is open to public 365 days a year. Tickets for the tour cost $14 which includes an informative audio tour of every cellblock there is. Each cell had a flush toilet which would flush just once a day, running water, a skylight, and central heating system. The reformers believed that no good could come from inmates mingling and hence decreed solitary confinement. No one served life there. A typical sentence was for two years but rarely exceeding eight years. Prisoners condemned to death were imprisoned elsewhere and not in ESP. The system was rigid, strict and the confinement in its effects turned out to be cruel. Every cell block has exhibits which talk about the history of the penitentiary and its infamous inmates. Few even believe the Penitentiary is haunted! The whole experience was spooky. Next up, we walked to Fairmount Dam and then on to Schuylkill River Trail. The paths running along the Schuylkill River seem to be a favourite for runners, walkers, bikers, and for those who want to take in stunning waterfront views of the Philadelphia Skyline. The last leg of my 2-day trip to the ‘City of Brotherly Love’ was a visit to the well-known landmark ‘Love’ itself! The sculpture is removed for renovation from its original place at Love Park and placed in The University of Pennsylvania, and this gave me an excellent opportunity to visit the beautiful historic campus of UPenn. Philadelphia the City so quaint yet to modern was a refreshing change and one of the best weekend getaways I have ever had. It not only enriched me with its history but also made me admire the City’s efforts to preserve its history, a story worth sharing with the current and future generations.